(Phys.org)—This colourful view of the globular star cluster NGC 6362 was captured by the Wide Field Imager attached to the MPG/ESO 2.2-metre telescope at ESO's La Silla Observatory in Chile. This new picture, along with a new image of the central region from the NASA/ESA Hubble Space Telescope, provide the best view of this little-known cluster ever obtained. 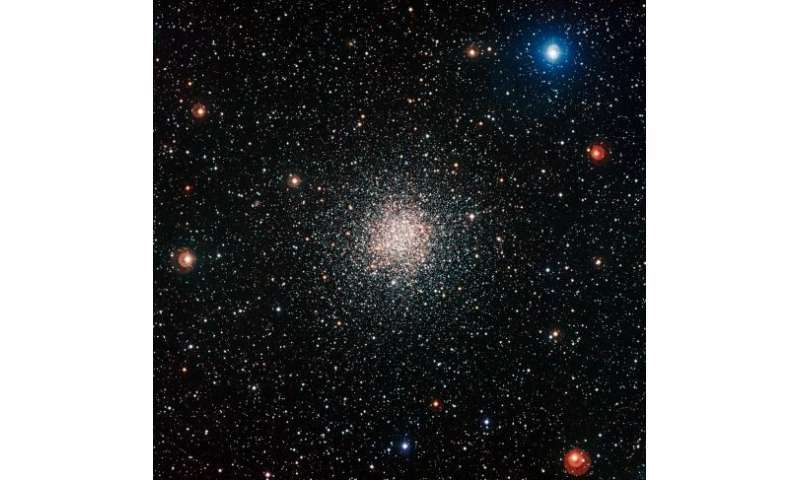 Globular clusters are mainly composed of tens of thousands of very ancient stars, but they also contain some stars that look suspiciously young. Globular star clusters are among the oldest objects in the Universe, and NGC 6362 cannot hide its age in this picture. The many yellowish stars in the cluster have already run through much of their lives and become red giant stars. But globular clusters are not static relics from the past—some curious stellar activities are still going on in these dense star cities. For instance, NGC 6362 is home to many blue stragglers—old stars that really do succeed in passing for a younger age. All of the stars in a globular cluster formed from the same material at roughly the same time (typically, about 10 billion years ago for most globulars). Yet blue stragglers are bluer and more luminous—and hence more massive—than they should be after ten billion years of stellar evolution. Blue stars are hot and consume their fuel quickly, so if these stars had formed about ten billion years ago, then they should have fizzled out long ago. How did they survive? Astronomers are keen to understand the secret of the youthful appearance of blue stragglers. Currently, there are two main theories: stars colliding and merging, and a transfer of material between two companion stars. The basic idea behind both of these options is that the stars were not born as big as we see them today, but that they received an injection of extra material at some point during their lifetimes and this then gave them a new lease of life. Although less well known than some brighter globular clusters, NGC 6362 holds much that is of interest to astronomers and has been well studied over the years. It was selected as one of the 160 stellar fields for the Pre-FLAMES Survey—a preliminary survey conducted between 1999 and 2002 using the 2.2-metre telescope at La Silla to find suitable stars for follow-up observations with the VLT's spectroscopic instrument FLAMES. The picture here comes from data collected as part of this survey. The new image shows the entire cluster against a rich background of the carpet of stars in the Milky Way. The central parts of NGC 6362 have also been studied in detail by the NASA/ESA Hubble Space Telescope. The Hubble view shows a much smaller area of sky in much greater detail. The two views—one wide-angle and one zoomed in—complement each other perfectly. This brilliant ball of stars lies in the southern constellation of Ara (The Altar). It can be easily seen in a small telescope. It was first spotted in 1826 by the Scottish astronomer James Dunlop using a 22-centimetre telescope in Australia. For a description of how these OLD blue stragglers form in dense regions of clusters under SubQuantum Kinectics physics, see my comments. Otherwise, sleep tight. Sure, Tux, why don't we abandon the sound merger and mass transfer models in favor of of a "theory" that doesn't pass even the most basic of smell tests, like the conservation of mass/energy?